Scrunch this Pearls Curtain up tight so that the beads are so full that they are "on top of each other", or use them fully opened up which is 40" Wide. Since the top is fabric, it will "scrunch" as narrow as 10 inches Wide! Instantly add sophistication and elegance to any room with our Fabric Top Curtain "Gabrielle", full of an abundance of huge ivory pearls, sparkling glass beads and a style that's second to none! 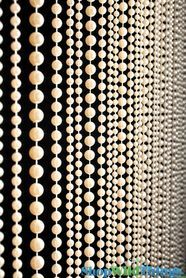 Gabrielle is a generous 7' long by 40" wide with lavish acrylic pearls that measure 3/8", 5/8" and 1" in diameter, interspersed with glistening glass beads. Very classy! There are 11 strands of delicious beads and the finishing bead is a 1 1/4" faceted glass ball. The polyester ivory rod pocket is laced with metallic silver threads and from top to bottom, this curtain literally oozes glamour! This is a meaty, hefty curtain that weighs 7 lbs 11 oz. When designing and decorating, the flexibility of a rod pocket is a priceless feature and this curtain will fit a rod or pipe up to 2" in diameter. Perfect for Pipe and Drape Event Canopies to create a sophisticated ceremony backdrop for weddings, special events, stage sets, outdoor celebrations, event tents or to use as a photo, video or head table backdrop. 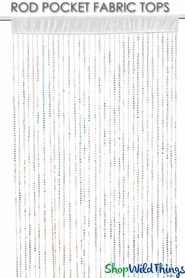 If your venue has a curved wall, columns or you want to hang this around a corner, no problem! The flexible fabric pocket allows you to scrunch the curtain together to accommodate smaller areas, creating a fuller look. Gabrielle accentuates any space and it's like adding jewelry to plain ordinary walls, mirrored walls, windows and she's the yummy icing to top off Sheer or Dense Fabric Curtains! 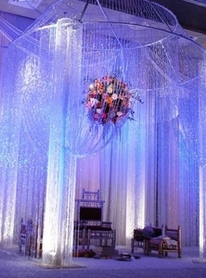 Use with an LED Light Curtain to really jazz up the look. The texture, beauty and visual interest of Gabrielle will truly elevate any space into a sophisticated focal point!